DETROIT — There were plenty of hits in Hockeytown on Wednesday night, June 12. They just didn't come from the Red Wings. 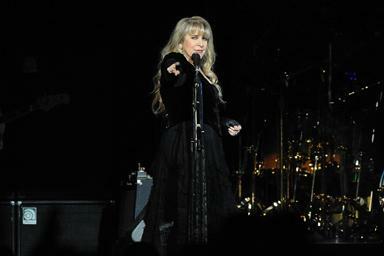 With the Stanley Cup Finals beginning in Chicago, fans instead packed Joe Louis Arena to hear an energized and ebullient Fleetwood Mac dig into a hit-laden catalog over a well-paced two and a half hours that showcased the tremendous commercial and creative success the 45-year-old group has enjoyed since Stevie Nicks and Lindsey Buckingham joined the band during the mid-70s. Christine McVie, the third songwriter in the group's multiplatinum golden age, is still missed of course, but this edition of Fleetwood Mac has, after three tours without her, clearly found a comfort level that has allowed it to expand and experiment a bit more than it's done in the recent past. And it's not like McVie's absence blows a debilitating hole in the Mac repertoire. Nicks and Buckingham are responsible for plenty of the group's hits, thank you, and Thursday's 23-song set — opening with a powerhouse trio of "Second Hand News," "The Chain" and "Dreams" — certainly served to remind us of that fact. But the night was also freshened by a pair of new songs — the uptempo "Sad Angel" and the poetic "Without You" — from this year's "Extended Play" digital release, as well as a mini-set spotlighting 1979's controversial "Tusk" album with the title track, "Not That Funny," a smooth rendition of "Sara" and "Sisters of the Moon," which Nicks told the crowd had not been played live since 1981. Nicks may possess the bigger hit moments — including "Rhiannon," "Gypsy" and her propulsive solo single "Stand Back" that's become part of Fleetwood Mac's arsenal — but Buckingham remained the group's most galvanizing presence onstage. His kinetic but still fluid guitar playing, both electric and acoustic, bolstered nearly every song played on Wednesday, and his own spotlights ranged from a frenetic one-man rendering of "Big Love" to extended solos at the end of "The Chain," "Go Your Own Way" and particularly the tortured epic "So Afraid." Co-founder and drummer Mick Fleetwood, meanwhile, was as solidly in the pocket as ever; even his solo during "World Turning" was relatively restrained, in a good way. And bassist John McVie remained a subtle secret weapon who does more to propel the group than most fans realize as they focus on his flashier bandmates. It made for a remarkably spirited exposition by a group of 60-somethings (and the four additional musicians onstage), and by the time Fleetwood Mac wrapped things up with "Say Goodbye," anyone at Joe Louis certainly hoped the group meant "until next time" rather than "for good." Yug, the return of the horrid petticoat skirt. Stevie has ditched the hankercief for the first time on this tour. Why she doesn't get how much better it looks on her than that messy petticoat disaster that makes her look much heavier? Please go back to the classic one! ! to the last post what is it, do you hate the world, you have nothing better to do than be negetive. maybe its cuz you can't afford to go to the concerts. I actually think the petticoat skirt looks better on her than the handkerchief skirt. It doesn't make her look as thick. She stills wears the handkerchief skirt jacket in the middle and end of the concert. And who cares what the hell she wears anyway!! I just can't get over how huge her feet are!! She must wear a friggin size 10 shoe!! I don't know how she moves in those huge boots!! !